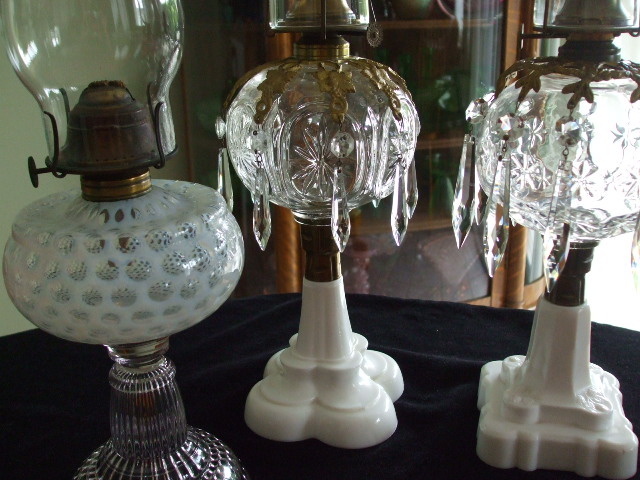 In Glassware > Early American Pattern Glass > Show & Tell and Lamps > Oil Lamps > Show & Tell. 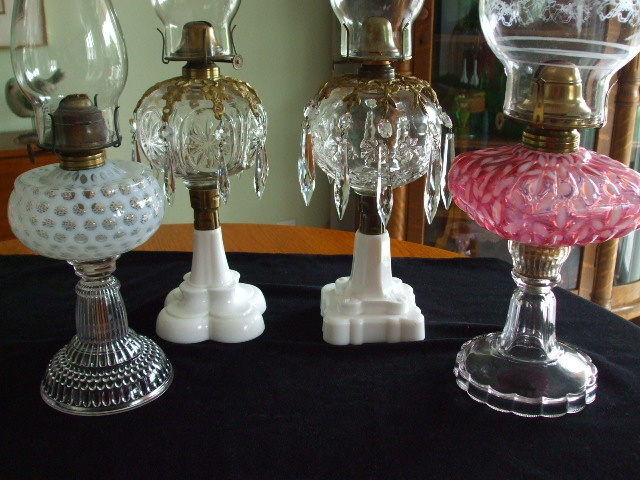 These four lamps are part of my Collection of Victorian-Era Oil Lamps and were made circa 1870's for the clear ones and in the 1880's for the Opalescent ones. They were made by Hobbs, Brockunier & Company of Wheeling, West Virginia and from the left is their Opalescent COIN DOT, the DAISY MEDALLION (my name for it), the HOBBS STAR and the cranberry Opalescent HOBBS SNOWFLAKE.. The prism rings and prisms were not sold as part of the lamps but were put on to "Gentrify" the clear lamps. In 1886, William Leighton, head of the manufacturing department of the Hobbs Brockunier Glass Company, and William Russell, patented a simplified and improved process for creating Opalescent glass products. Under the Leighton-Russell patent, a mold was created as close to possible as the desired final shape of the object. The surface of the Mold was indented to allow for the formation of the desired nodules or projections. Molten glass was pressed into the mold and then removed. The resulting object was cooled quickly with a blast of cold air and was then reheated. As in the original process, the protrusions on the surface of the object resulting from the indentations in the mold having cooled more quickly and more fully than the body of the object, turned the desired whitish color. This improved process allowed for quicker and something closer to mass production of Opalescent glassware without the need for highly skilled glass blowers. 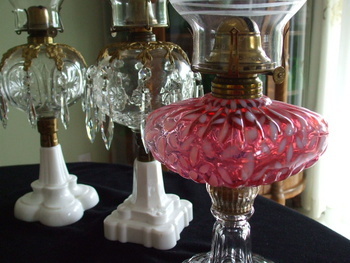 An article in The Glass Encyclopedia expands on the above process description, adding that this type of opalescent glass was made of two layers of glass with the thin outer layer, which fills the indentations in the mold, being made of a heat sensitive glass which turns milky-white on reheating. Cranberry Opalescent glass required a very strict formula of a mixture of gold dissolved in Aqua Regia (a mixture of hydrochloric and Nitric Acids). The amount of the Gold and acid solution added to the molten glass determined the darkness of the color. Somewhat less solution resulted in a lighter colored "Cranberry" glass while more of the solution resulted in a deep "ruby" colored glass. If the intended color of the lamp was clear with a white opalescent pattern, then the inner layer of glass would have been clear. Other mixtures were used for different colors such as Uranium Oxide (uranium salts) for Blue, etc. Producing Opalescent glass, especially cranberry opalescent, was still a time consuming and expensive process; thus the many variations of the Hobbs opalescent glass lamps are considered highly desirable by collectors, are increasingly hard to find, and tend to bring relatively high prices with the cranberry lamps generally commanding higher prices than the blue ones and the blue ones higher prices than the clear ones. 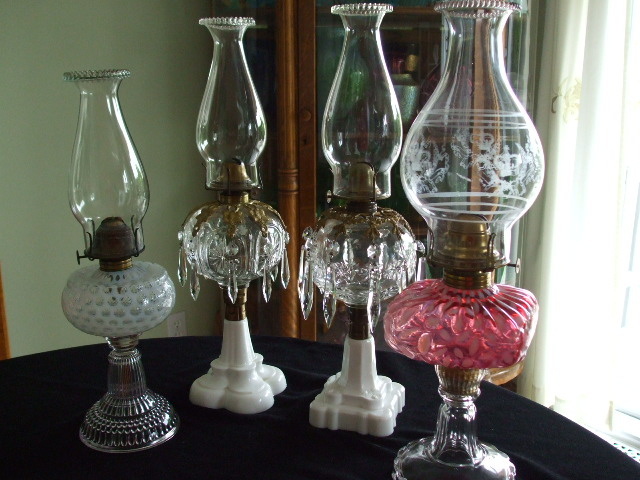 Of course factors such as condition of the lamps, the sizes and the strength and uniformity of the opalescent pattern are prime in their valuations.